A few weeks ago I entered a Twitter contest run by Wipebook and I won a Wipebook Mini Notebook and the Wipebook Flipchart. I was really excited to see how these dry erase products would work. I currently spend about $1 a month on a notepad I love from Dollarama. That said, I am mostly digital in my role so I would likely be spending be more if I were in the classroom taking more on the fly notes. The costs of the mini notebook is $25USD so a bit on the high side for me....but I LOVE that I am being much more eco-friendly. I really like crossing things off my to do list - but I also like a clean list and the notebook is PERFECT for this. As soon as a task is done, it disappears! The pages erase very easily with the eraser on the pen or a damp cloth if you want to get it super clean. The pen fits nicely into the coil binding but it has fallen out a few times forcing me to dig through my bag to find it. I tested it with my left-handed son and there was no smudging of the ink - although he is in Kindergarten and writes slowly so a faster stenographer might smudge a little. There is an app to go with it and you can upload notes to a variety of place (Google Drive, etc.). I used it a little and it worked well...the quality of the image is a little grainy though so not great for my sketchnotes - I will stick to traditional paper for that. All of the above holds true for the flip chart as well. Overall, I like the product and since I only have to buy one, the cost is not an issue. I think it is worth the investment for chronic list makers like me! Click the image to access the slide full of links. 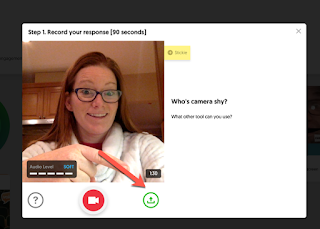 While working with a school this week, one teacher (shyly) admitted that he liked Flipgrid, but he did not feel comfortable filming himself. This was not the first time I have heard this. I like to challenge people to venture outside their comfort zone but I am not always successful. I fear that there are educators and students who are avoiding this great tool because they think they need to be on camera. I'm here to tell you that is not the case! Flipgrid has an option to upload a video rather than film live. The best part is you don't need fancy video production tools to film...there are plenty of free, simple tools you can use. In the spirit of curating, and not dumping (see The Cult of Pedagogy blog post if you don't get my reference - it is a superb read), I have curated a list of 5 (well 6) tools you can use to create videos to upload to Flipgrid. Note: For the first three tools you need to Appsmash (using multiple apps in conjunction with one another to complete a final task) with my favourite free screen casting tool - Screencat-o-matic. I love screencast-o-matic because in the free version you can record up to 15 minutes, crop the recording area, and trim the recording. All videos can be saved to your local drive as mp4s. AND...it now works on Chromebooks!!! In the free version of Voki you can use pictures from a selected, customizable list of Avatars and backgrounds. Then you can record your voice, type a message that can be read in a voice of choice, or upload a pre-recored message. 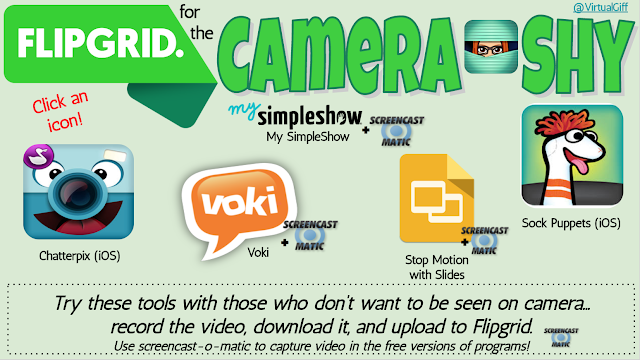 Published Vokis can be shared on Twitter, Facebook, G+, email or via link, but for Flipgrid, appsmash with Screencast-o-matic to record the video. My Simple Show is a video explainer. You write a script, it suggest photos to insert into the presentation, and (in the free version) it narrates for you. You need to upgrade to record your own voice BUT of you appsmash with screencast-o-matic and you can mute the narration and record a voice over! This is one of my favourite slides activities. Essentially, you put a character on a background, make tiny tweaks on each slide and them publish to the web to make a mini movie. This tutorial by Kim Pollishuke and Sandra Chow is a great resource to teach how to make stop motion videos using Google Slides. Again, appsmash with screencast-o-matic to add narration. Chatterpix is likely the easiest tool to use. You to upload a photo of your choice, then you draw a line across the mouth in the photo. You can record your voice and add filters and stickers to your recording. When you are done you can emails yourself the .mp4 file that can be uploaded to Flipgrid. Best of all - it is free! 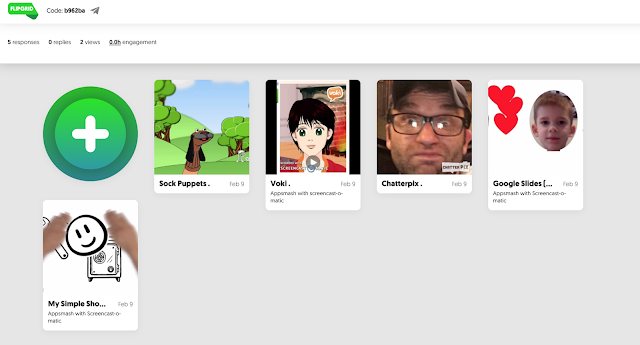 Sock Puppets lets you create your own lip-synched videos. The videos feature sock puppet characters, customizable backgrounds, props and scenery. Finished videos are saved to your camera roll and can be uploaded via the Flipgrid app. Check out my Grid for quick examples of each tool and get even the most camera shy participant Flipgridding (yes, I made it a verb - that's called anthimeria btw) in no time.